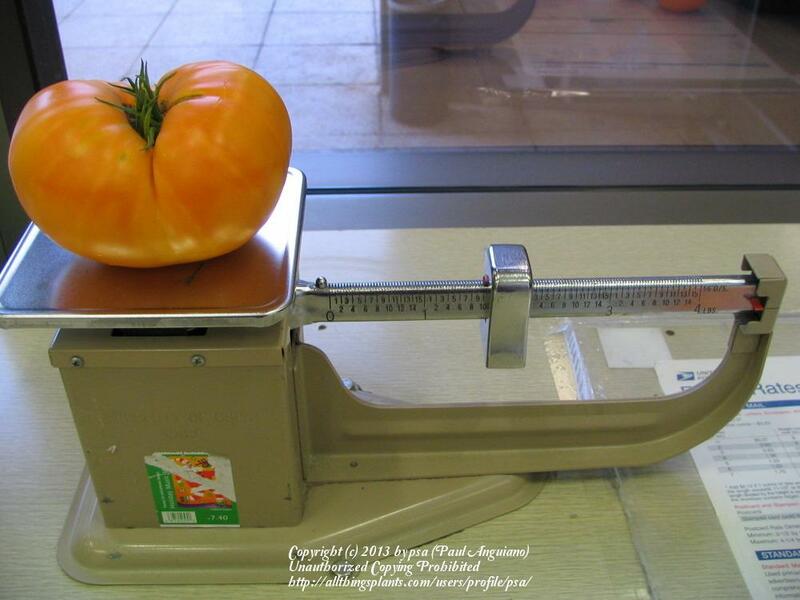 What could you compare to a ripe tomato, fresh from the garden? Tomatoes are consistently one of the most popular edible garden plants, grown all over the world, yet most people have only tried a bland handful of the thousands of varieties available. For decades tomato availability was controlled by canning, shipping, and mechanical harvesting and processing needs, but now we're finally seeing a return to the flavors, textures, and versatility that made tomatoes so compelling in the first place. The tomato treasures that our great grandparents kept have returned to us. These tomatoes, in turn, are entering new breeding projects to further tease out their strengths. 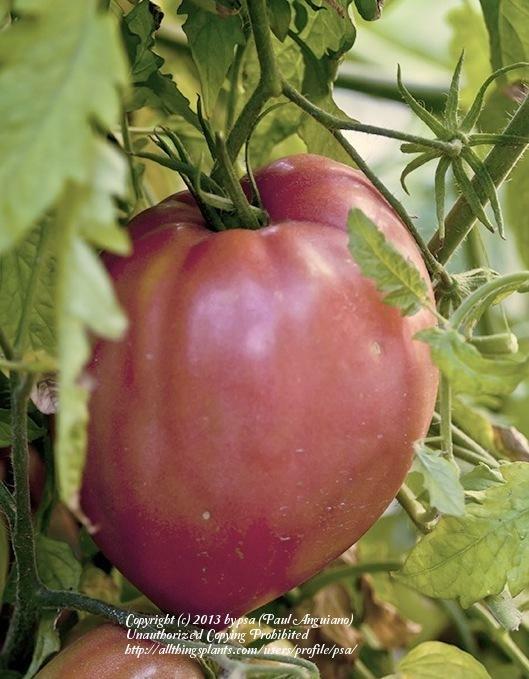 My historical interest in tomatoes starts a little over a century ago when people really got involved in creating and maintaining new varieties, colors, shapes, and sizes of plants and fruit. The seeds of Brandywine, Beefsteak, and so many others built the foundation for all of our modern varieties. Today there is renewed interest from the gardening community in keeping alive all of this diversity; the efforts of many people have come together to preserve and distribute this bounty. I'm going to talk about how you can give these plants a happy home in your backyard, discuss the types and terms you should be aware of, and send you off on your own exploration for answers that you never knew you had questions for. Luscious though the fruit may be, tomato plants are toxic nightshades, so don't eat anything but the fruit and wash your hands after handling the vines. They can be kept year round in the absence of extreme weather, but most plants tend to lose their vigor and will do better if planted anew, either from seed or cuttings. 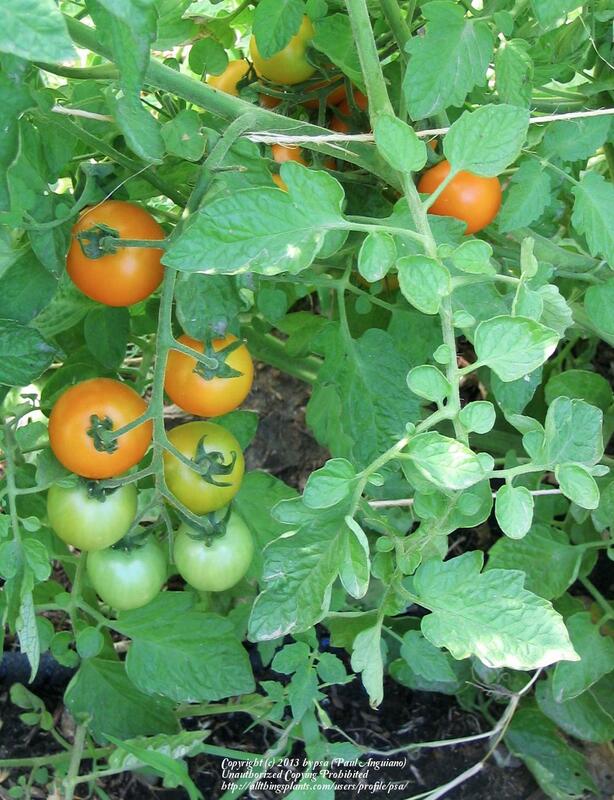 All parts of the tomato stem will root if given the chance, so be sure to bury the plants deeply when transplanting to provide enough nutrients for the huge berries that you're going to coax out of them. 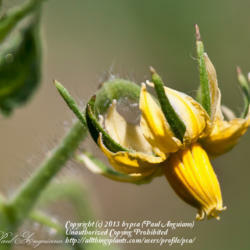 Tomatoes need nothing more than wind to pollinate them. However, the wind isn't blowing the pollen from plant to plant like corn stalks; each flower pollinates itself when lightly shaken, and most never open up enough to cross with their neighbors. Bees of all kinds are known to visit the flowers (less so the honey bees), but they aren't needed for the plant to produce fruit. 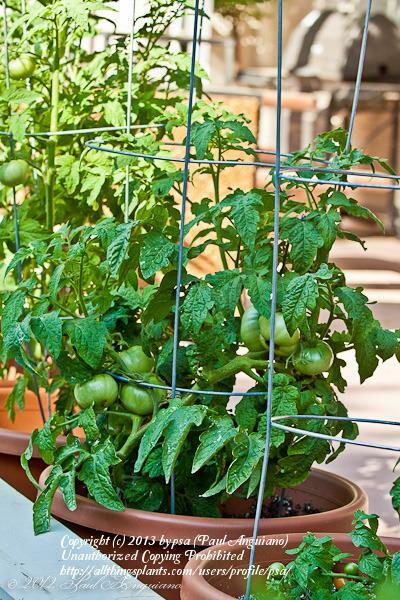 Tomato plants also need plenty of water to meet the huge demands of their growing fruit, but they'll rot and get diseases if left in soggy soil or stagnant, humid air. I recommend soaker hoses and mulch to keep the root zone well aerated, but evenly moist. Compost and other organics turned into the ground before planting will break up the soil, feed the roots, and retain water where it is needed. Finally, tomato plants are heavy feeders. They will need a balanced diet to grow out those sturdy vines. As they fruit, potassium, magnesium, calcium, and all of the minors have a stronger role to play. Avoid the common high nitrogen fertilizers that can build rapid, lush growth that diverts energy from fruit production and will produce soft, rangy vines that are less able to support new fruit. Also, try to keep your soil pH neutral to avoid locking up nutrients that the plants need access to. Soil tests every couple of years will catch problems caused by added soil amendments breaking down and modifing their environment. Chemical fertilizers aren't really needed; all of the nutrients my plants require come from the compost mix. Once you've figured out your temperature, soil, and water needs, you need to think about the length of your growing season. Tomatoes survive temperatures down to freezing, but cold weather shuts down growth and destroys the flavor in the fruit below around 45°F. Daytime highs below 70°F make it difficult to ripen fruit, and anything above the high 90s will likely prevent setting new fruit. Some of the hotter parts of the United States have two growing seasons--one on either side of the blazing heat of summer. In the far North they have one short season, where they can use south facing walls and cold frames to provide extra heat and protection. Most shorter season varieties suitable for these areas are small to mid sized tomatoes. Don't worry about not getting good yields, though. The highest producing plants are rarely the ones with the largest fruit. Cherry tomatoes are also a winner in every area, and be sure to check out the determinate varieties if you're really on a tight schedule. They tend to produce their entire crop at once in a big burst that doesn't waste energy on new green growth that won't live long enough to bear new fruit. If you are blessed like we are with a long growing season (four months or more of consistently warm weather) you can also grow the long season beefsteaks that slice up big enough to hang out on all sides of your sandwich. Be aware that some of them (like Brandywine) do poorly in hot, dry areas; some are prone to disease and rot in wet, humid climates, and others have trouble ripening unless they get lots of heat. For all of your tomatoes, look for indeterminate types that will keep growing all season long, providing a continuous crop until frost. 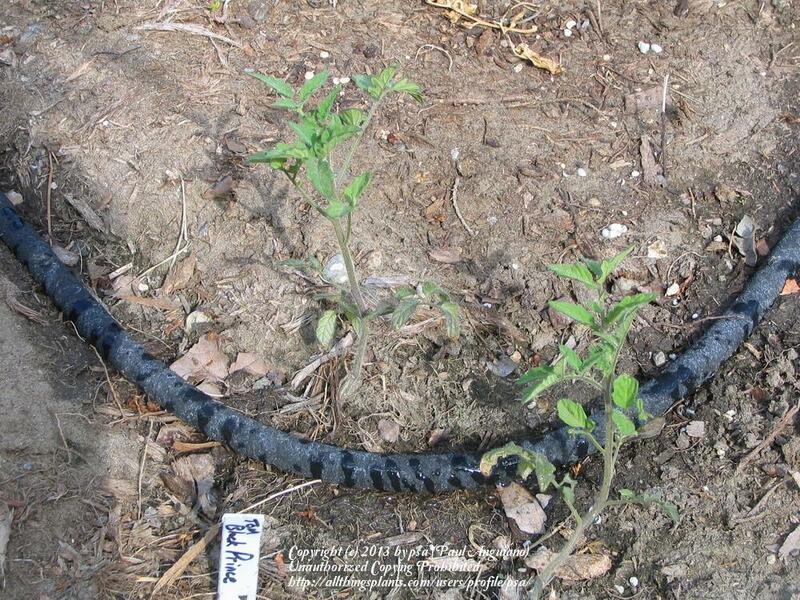 Remember to stake, tie, or contain these plants with something sturdy, because those wimpy little round tomato cages aren't going to keep up with the continual growth and vigor of an indeterminate. We've discussed cherry tomatoes, small salad tomatoes, intermediate slicers, and massive beefsteaks, but this is just the appetizer to the buffet that is available. Grape tomatoes are actually a different species, remaining firm when ripe. They are often available in grocery stores because they ship better than others, and keep well. Gardeners will find that they also hold well on the vines giving you more leeway when you pick them. You can't go wrong with any variety here; they're all fairly similar, and many have the word 'grape' in their name. Plum tomatoes include the famous Roma, but also a tremendous number of other varieties of drier, sturdier, more elongated fruit. San Marzano, Heidi, and Opalka are some of my favorites. Heart tomatoes are sort of a cross between plum tomatoes and beefsteaks, and often very meaty, flavorful, and productive. I haven't found any that I didn't like the taste of. Kosovo has been my favorite these last couple of years. Currant tomatoes are tiny little delicacies, rarely seen for purchase because they are too labor intensive to pick by weight. Like the grape tomatoes, they are a different species than the common type of tomatoes. Many of the currant varieties available today are known or suspected to be crosses with more traditional cherry tomatoes. The flavor is amazing, but we hardly get any of them into the house without eating them first. Mexico Midget and Sara's Galapagos are two fine crosses in this category, but look for something with the word 'currant' in its name if you're looking for the original deal. Stuffing tomatoes are hollow on the inside, somewhat like a fleshy bell pepper. I thought they had fallen out of favor until my wife turned them up at a small grocery store in Lusk, Wyoming. She reports that they're delicious stuffed and cooked. Storage or long-keeper tomatoes are green and hard when picked, but slowly soften up over the following months. They may or may not color up, and the flavor and texture leave much to be desired, but if you have to have fresh tomatoes in the winter they might be your thing. One other form that I think is worth mentioning is the Dwarf indeterminate. More a plant type than fruit type, they are available with all different types and colors of fruit. New varieties coming out of the Cross-Hemisphere Dwarf project are really amazing. With fruit from small to massive, these plants take up half the space of their full size cousins and are ideal for tight spots and containers. I've recently gotten involved in their grow out and selection process, and am very impressed with the flavor and fruit quality they've been able to maintain. Add to this list variegated, feathery-leaved, and many other ornamental and novelty types. Leaves may be deeply incised as is most common, or whole and 'potato-leaved' as in the picture of the dwarf on the right. And if you're one of those who thinks that tomatoes are red, you need to get out more. There are fruity yellows, smoky purples and blacks, milder whites, full-flavored pinks and oranges, and spicy green when ripe varieties. And bicolors, tricolors, and stripes! Species tomatoes, like current and grape, hearken back to the days before we started intentionally cross breeding them. There is less difference between varieties, but more variability between individual plants. Breeders use them to bring desirable traits like flowering characteristics, flavors, and disease resistance to our better known varieties. Heirlooms are tomatoes with history. Definitions vary, but they are invariably old and have been passed down for generations. Some of them were acquired from families that nurtured and selected them year after year. Others come from turn of the (19th) century companies that released them so long ago that people forget where they came from. Finally, there are the older University releases from a time when these programs were run for the public good, rather than fighting to keep themselves funded. 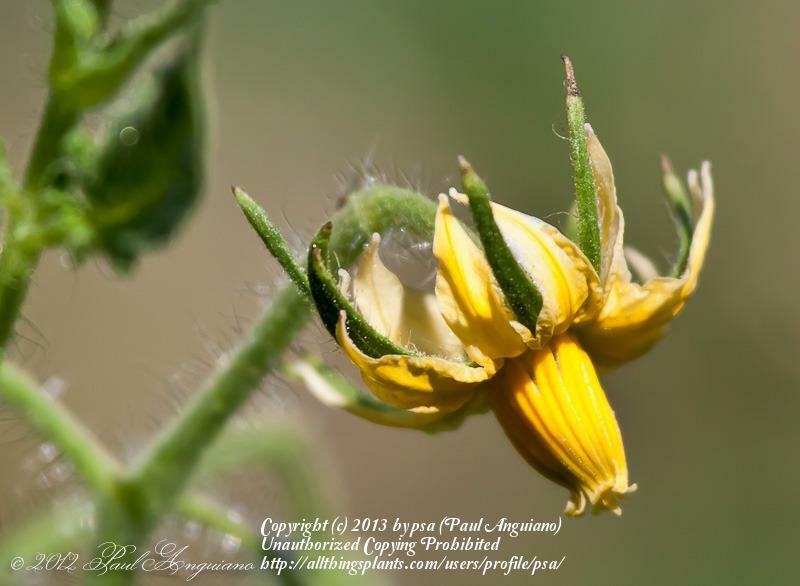 Open pollinated tomatoes technically are any type that reproduce themselves without people involved in pollinating them (see hybrids, below). However, many people use the term to mean those whose offspring will be true to type. Heirloom and species categories are a subset of this one. If you save seeds from one of them (assuming the bees haven't managed to cross them up) they will grow into plants that look and bear fruit like their parents. Tomatoes are in-breeders, meaning they cross with themselves, producing homozygous varieties that never vary generation to generation, except by chance mutation or unexpected cross. In recent years, more and more of these mutations (some of which are known as sports) and crosses, both unexpected and intentional, have been grown out to produce new types of stable varieties. After ten generations or so of careful selection, the offspring tend to stabilize, and a new variety is born. The Cross Hemisphere Dwarf project managed to release new varieties in half the normal time by growing them out twice each year, sending their seeds North and South across the globe with each generation. Hybrid tomato varieties have intentionally had their genes split between multiple lines (themselves stable varieties) so that when crossed together they will always produce the same genetic tomato, but with mismatched genes. Also known as F1 seeds to indicate the first generation after a cross, they will all produce identical plants and fruits, but only for that generation. F2 and subsequent generations will vary wildly, to the point that it can be very difficult to impossible to find plants with the right combination of genes to be a match for the F1 generation. Seed companies (and now, universities) do this intentionally to prevent growers from saving seeds so that they will have to buy new seed each year from the original breeder. Don't be too hard on them--they have to make money to pay for the breeding project somewhere. Just remember that a hybrid variety is only as reliable as its source. Companies can and do make changes to the make up of their hybrids year to year, and if a company ever stops making a hybrid because of cost, acquisition by another company, or just to force you to buy something else they're trying to sell, that variety will be gone forever. If you are ready to get started with your tomatoes for the new year, I recommend checking out the Recommendations link on this site. All of my favorite vendors are there and you are welcome to add your own. As the owner of Mid Columbia Gardens, I grow out 10,000 plants every spring here in Southeastern Washington State, mostly tomatoes, and am just getting ready to sow my first seeds. They germinate at room temperature and are ready to be transplanted into pots at about two weeks, when they all have a healthy set of true leaves growing between the cotyledons. They get 4-6 weeks of growth in their pots and then are set out to harden off in the chilly spring air, covered up at night for protection. The process of growing tomatoes seed to seed would be another article in itself. Our last frost date isn't until the beginning of May, but there are always people looking to plant them in mid April, hoping to get a jump on the season. I would advise you to wait, though, unless you've got a cold frame or some structure to put over them and bring up the temperatures. 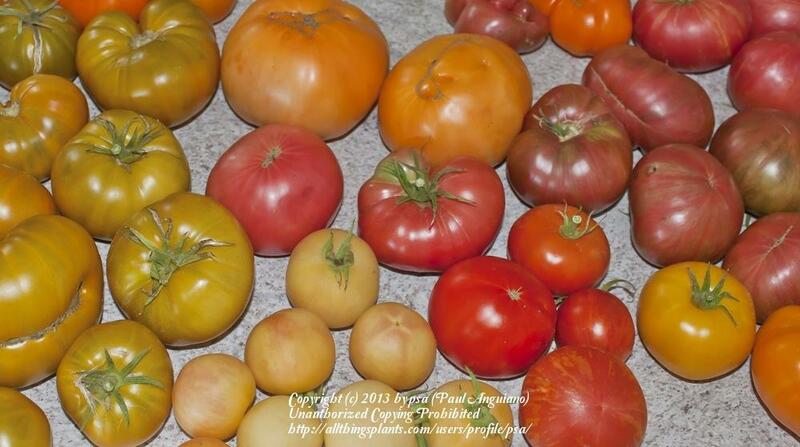 For information about varieties, you can't beat Tatiana's Tomatobase. This is absolutely the ultimate resource in compiling every tomato variety she can find. It is cross referenced to the Seed Saver's Exchange listings, her own pictures, experience, and categorization, and a list of vendors who sell each one, or have sold them in the past. She's also a vendor of seeds in her own right, and I can vouch for the quality and purity of the seeds she has sold me. For community resources, it's hard to top Tomatoville, home of the aforementioned Dwarf Project, and favorite hang out of tomato fans and some of the great experts in the field of tomatoes. Many of these people are also seen here and in other forums sharing their passion for tomatoes and gardening. 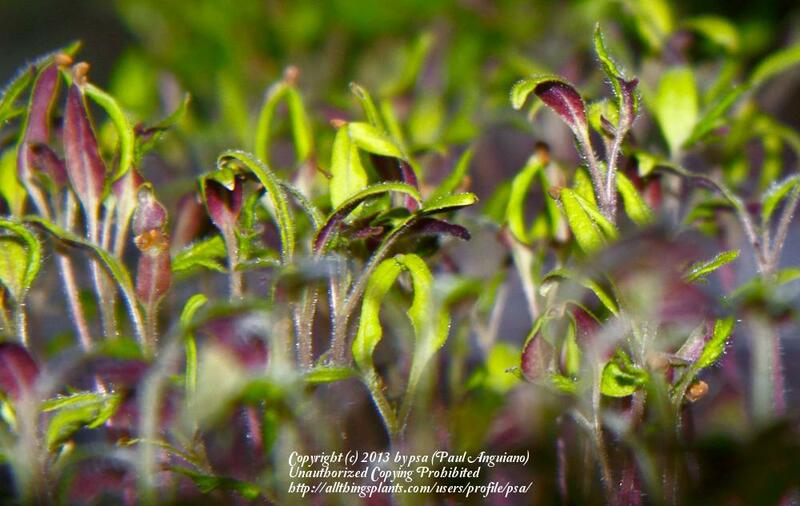 Finally, don't forget our own Forums and Plant Database here on All Things Plants. They need your input, and all of us are stronger working together. You can't succeed in what you don't attempt, you can't overcome what you never struggle with, and life's too short to go it alone. Paul Anguiano, the tomato guy. Living and Growing in the Beautiful Tri-Cities, Washington Region.